The Vanessa Behan Crisis Nursery provides immediate refuge for children and support to strengthen families. They provide 24-hour child care for infants and children under the age of seven, parent education, crisis counseling for parents and assists with referrals to other community agencies when needed. The Crisis Nursery helps provide safe shelter and care for children whose parents may be exhausted and worn-out from the demands of parenting or dealing with more complex issues such as substance abuse, domestic violence and homelessness. Go to https://www.vanessabehan.org/about for more information. The core of the Vanessa Behan Crisis Nursery is relationship, but completing required paperwork limited the time available to assist families. Every time a child was dropped off at the Nursery, a family support specialist met with the family in the Crisis Nursery’s living room setting and began to grow their relationship. First, they needed to complete a stack of paperwork that took between fifteen and twenty minutes to fill out. Little time was left to provide meaningful assistance. From the moment we interviewed the IntelliTect team, we knew they were the right fit for our culture to deliver a product that would meet the unique needs for preventing child abuse and neglect in our community. A secondary issue developed when state licensing mandated that all their intake paperwork be stored for a minimum of seven years after they stop doing business, a dramatic change from holding each case for five years after their last visit. Their fifteen filing cabinets of paperwork would grow continually, causing a storage issue. With no intention to close their doors, the Crisis Nursery needed to find a solution that would streamline their tedious paper and pen intake process while maintaining the safety of every child in their care. They sought to upgrade to an automated system that would save information digitally, eliminating the need for onsite storage and allowing for more time to build relationships with parents. Moved by this non-profit’s care for the community of Spokane, IntelliTect offered to do the project at cost. The IntelliTect engineers took on the project and created a framework to simplify the process of creating great websites. As a result, they built the web-based system quickly. This new system allowed for much more than the Crisis Nursery was expecting. 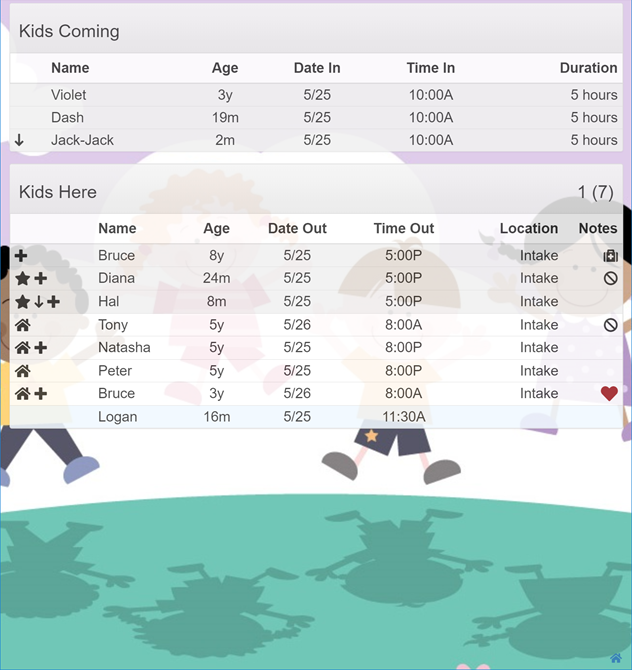 Scheduling page – shows how many children they can accept at any given time based on how many staff they have on shift. This page helps the Nursery keep in compliance with their one staff member to every four children ratio. It also shows in real-time who is coming to the Nursery, who is already here, who will be leaving and who has recently left. The status board on the new site is an important safety feature according to Amy Knapton Vega, executive director of the Crisis Nursery. She said that the screen limits the risk factor of losing track of a child. More importantly, it provides vital information on the children in their care via easy to recognize icons that denote needed medications, allergies or other pertinent information (see screenshot). Previously, house parents needed to search through a child’s file for this information. Now, these details are immediately accessible and kept securely on the computer so that visitors to the Nursery don’t see anything confidential. The new system was also designed to catch mistakes as they’re entered to streamline the intake process further. A cell turns red when there’s an error and shows what is required to correct it so that entry can continue smoothly. Errors are now addressed before it comes time to save the potentially lengthy document. I wanted to let you know how incredible IntelliTect has been to work with. The solution that Grant and his team built has completely transformed the way the Nursery operates in such an awesome way. Intellitect also received the Heart of Gold Award for their outstanding support in this effort. This award is given to a business, an individual, or an unsolicited nonprofit that has contributed significantly to the success of the Crisis Nursery during the past year. It can be through a one-time contribution or volunteer effort, or it could be given in recognition of on-going support given over a period of years. If it is a one-time recognition, as IntelliTect’s was, the contribution must be very impactful to the success of the Nursery in its ability to carry out its mission. The relationship between IntelliTect and the Crisis Nursery is ongoing. In time, IntelliTect hopes that other nurseries will leverage this software system to further their own work with children.